In an unexpected statement this weekend, Mr O Bradaigh confirmed that he would not be seeking the position of party president at the forthcoming Ard-Fheis [annual conference]. I wish to record my appreciation and thanks to all who worked with me over the past sixty years,” he said. Mr O Bradaigh, who turns 77 next month, joined the IRA at a young age and remained a stalwart of traditional Irish republicanism throughout his life. Possible successors include vice-president Des Dalton, Mr O Bradaigh’s son Ruairi Og O Bradaigh or Galway county councillor Tomas O Curraoin. A former chief of staff of the IRA, the Longford man was president of Sinn Fein between 1970 to 1983 before being replaced by Gerry Adams. He has held the position of president of the breakaway Republican Sinn Fein since its inception 23 years ago. The party was established after Mr O Bradaigh and other hard-line republicans walked out of Sinn Fein’s Ard Fheis in Dublin in 1986 after a majority of delegates voted to recognise the Dublin parliament as Dail Eireann. 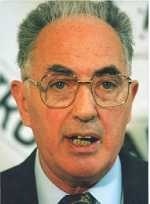 Since the mid-1950s, Mr O Bradaigh has played a key role in the Irish republican movement. The child of Irish Republican veterans, Mr O Bradaigh has led IRA raids, been arrested and interned, and even spent a period of time on a hunger strike. In 1955 he led a daring raid on British Army barracks in Berkshire, seizing a vast array of arms and ammunition, after which he served six months in Mountjoy Jail and then was interned at the Curragh. During his time in prison he was elected TD for Longford-Westmeath but refused to sit in the Dail. He has at different times been excluded from the Six Counties, Britain, the United States, and Canada. He was a key figure in the secret negotiation of a bilateral IRA-British truce. Educated in St Mel’s College and University College Dublin, he was elected to the executive of the military council of the IRA in 1954. In February 1962 it was Mr O Bradaigh who called the end of the 1956 to 1962 IRA ‘border’ campaign. Throughout the 1960s he taught in Roscommon and was an active member of Sinn Fein. In 1972 he was arrested under the Offences Against the State Act and immediately went on hunger strike. After two weeks the charges against him were dropped and he was released. It is understood, though Mr O Bradaigh is not seriously ill, he has been advised by doctors to reduce his work commitments. His tiny party remains dedicated to continuing the Irish republican tradition but is reviled by the Irish political establishment, who have identified it with the Continuity IRA. With an almost invisible media profile, it has long struggled to make electoral progress.